Summary: It was a beautiful, warm summer day, the day Danny died. My Thoughts: We are introduced to Wren who is a high school student. She has two best friends she has neglected. She just has too much going on in her life to handle friends right now. She has been dating Danny and they make the perfect couple. She's really in love with him. But there was a car accident; the car crashed into a tree. One boy was paralyzed, one boy died. Danny is the boy who died in a car accident. Wren is a special girl. How special you ask? Special enough to raise him from the dead! He's back and he's living next door. More like squatting next door. Nobody knows he's there except for Wren.... at first..... Wren visits him every chance she gets, pretending like nothing has changed, like he hasn't changed. There is a new boy at school; Gabriel. He lives with his older sister. What can I say about Gabriel? I liked him a lot. I never really felt much connection to Danny, I just didn't feel the love for him but Gabriel I instantly clicked with. He was funny, sarcastic, and sweet. I guess its because we never got to know Danny when he was alive so he felt more like a zombie (kind of) and his feelings didn't run as deep. I'm sure he did love Wren when he was alive but in death, he just "needed" to be around her. Wren knows there is deep power inside her, she knows it isn't right she brought her boyfriend back from the dead, she knows it isn't right he's living in the house beside her, she knows the attraction to the new kid while her old boyfriend is still around isn't right, but she can't help it. She's drawn to Gabriel. He knows her secret. He knows her. He understands her. What happens to Wren and Danny? What happens to Wren and her power? Where does Gabriel fit in? Want to know what happens? Read the book to find out. 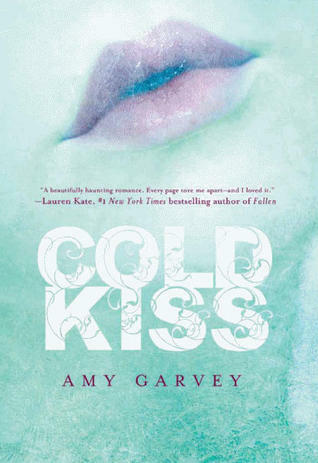 Overall: I really really enjoyed Cold Kiss. It was a wonderful debut. It was a beautiful thrilling story. I couldn't stop reading once I started. I loved the characters, I loved the voice. I want to know why Gabriel can sense the things he does. Is there more to the story behind Wren's gift? I want to know more! I hope there is a sequel. Cover: The cover is somewhat plain but still interesting. I like the colors and of course the lips. I haven't had a chance to read this one yet, though I've been wanting to for a while! It sounds really interesting!